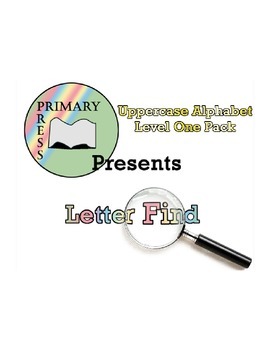 The Uppercase Alphabet Letter Find Level One Pack contains all 26 Letter Finds for each uppercase letter of the alphabet. You get a greater deal per worksheet if you decide to purchase the pack. This product will help your students learn their letters! Children are required to recognize all 26 letters of the alphabet in both upper and lowercase. That is a total of 52 characters! Each Letter Find has students search for a particular letter hidden among other letters that look similar to the target letter. 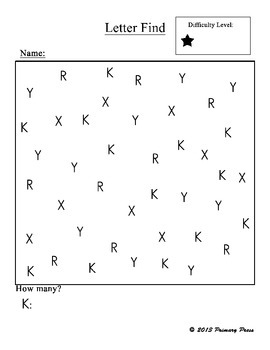 The task is for the child to visually discriminate between the letter they are looking for and the other letters. Paying attention to the shapes of the letters helps children learn. Children circle each target letter and then write how many they found on the line below. 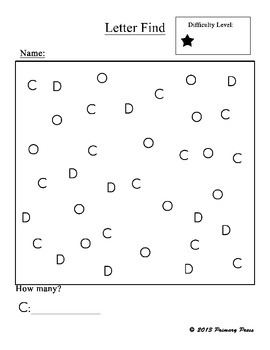 Each Letter Find has a level of difficulty indicated by the number of stars at the top of the page. How do the difficulty levels differ? These Letter Finds have the student look for only one letter in either it’s lowercase or uppercase form, using a sans-serif font and all the characters are the same size. These Letter Finds have the student look for both the lowercase and uppercase letter form, using a sans-serif font and all characters are the same size. These Letter Finds have the student look for both the lowercase and uppercase letter form, using a sans-serif font but the characters range in different font sizes. These Letter Finds have the student look for both the lowercase and uppercase letter form with varying fonts! There will be the standard block font from the previous Letter Finds, a serif font, and a script-like font. 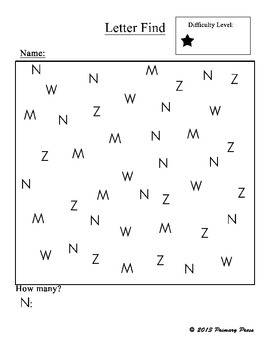 Level Four Letter Finds challenge the ability of the student to make generalizations about letters across multiple representations of their shapes.